This charming, 1400m2 holiday home is located in a small holiday development in the middle of the forest. The wood-burning stove in the living room makes for an especially cozy stay. The terrace behind the house is great for drinking a cup of coffee while taking in the peace and quiet of the natural setting. The park has various facilities. Children can play to their heart's content on the playground, but you can also go for a swim (from May to mid-September) or go head to head on the tennis or petanque court. The area is also perfect for hiking and biking. Bicycles can be rented at the reception desk in the holiday park. The woods, meadows, and sand drifts in Lemelerberg are great hiking options, as well as along the banks of the Vecht and Regge rivers. Sallandse Heuvelrug National Park is located just a bit farther away and is also a wonderful place to go hiking. Wi-Fi is only available at the reception and not in the house itself. 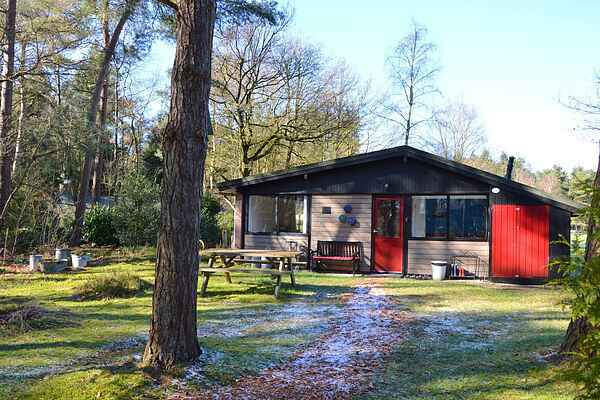 The towns of Ommen and Den Ham are just a short distance from the holiday home. There you can visit Castle Eerde, stroll along the quaint streets, or relax at an open-air cafe. Hellendoorn Adventure Park or one of the museums in Ommen (like the National Museum of Tin Figurines or the Agricultural Museum) are also fine options. The stunning Museum de Fundatie in Castle Nijenhuis is located in Heino and has a sculpture garden. A visit to Zwolle, the capital of the province, is also not to be missed.